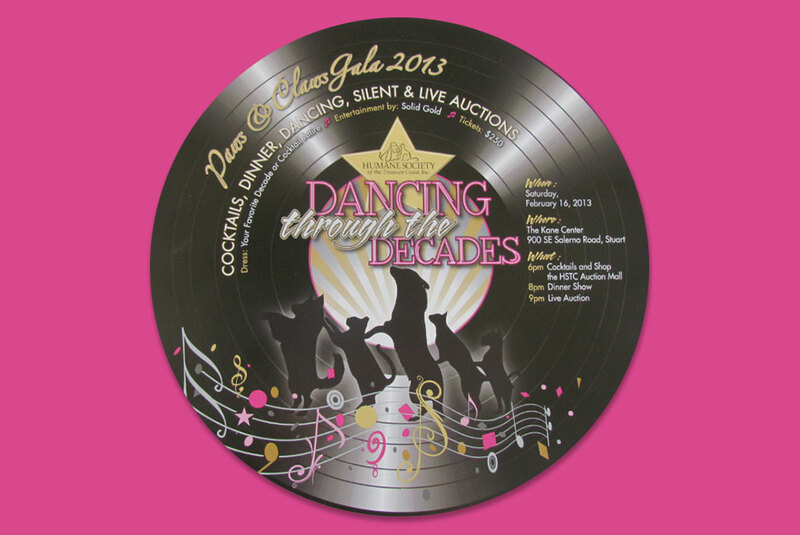 Another example of the outstanding design talent located here on the Treasure Coast is the invitation package and program designed by Debbie Kearney at Barrows Kearney Design Group for the upcoming Humane Society of the Treasure Coast‘s annual fundraising gala named, ‘Dancing through the Decades’. The main feature of the four piece invitation package is the circular die cutting for the full-color invitations and RSVP cards. As you can see, the invitation was designed to look and feel like an actual record album, while the RVSP card replicates a compact disk. Both items were printed on our 5-color Heidelberg Speedmaster offset press and then die cut on our Heidelberg KSBA die cutting press. There is no doubt the recipients of the invitation felt like dancing as soon as they received the package in the mail and opened the outer envelope. A big thanks to Jackie Ranaldo, Community Relations Manager at the Humane Society, for choosing Multicolor Printing to produce and mail the package.